Thank goodness the government isn’t shut down in Europe, as it’s allowed Half-Life 3’s trademark to go through with nary a snag. That’s right, Valve has filed for a trademark for their highly-anticipated game. 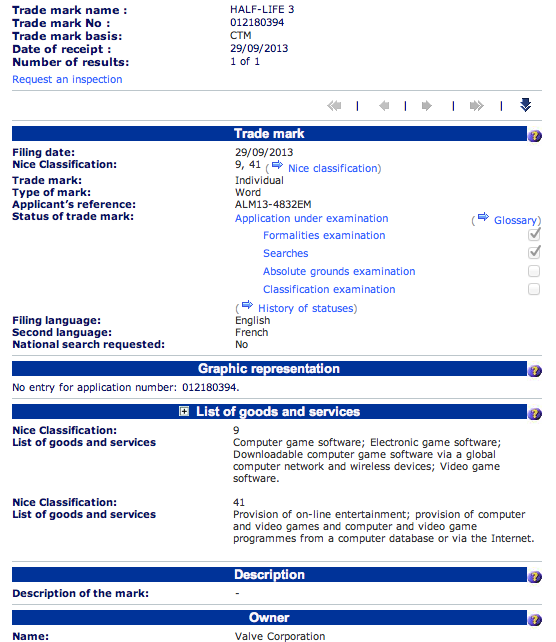 The application was filed in Europe on September 29 of this year and is stated to be for “Computer game software; Electronic game software; Downloadable computer game software via a global computer network and wireless devices; Video game software.” So no, this isn’t for Half-Life 3 t-shirts the company could taunt us with. It’s unclear if this signals Valve is gearing up for a Half-Life 3 release or if they’re simply trying to secure the brand. Of course, waiting several years to simply do the latter doesn’t make a whole lot of sense. We’ll follow the story and make sure to continually check for any US marks. Head over here to view the trademark in full.